Police seized a rocket launcher, TNT and dozens of weapons from a South LA home after a motorcyclist was spotted carrying a rifle. SOUTH LOS ANGELES -- Los Angeles police seized a rocket launcher, rifles, TNT and dozens of other weapons from a South LA home after a man was spotted riding a motorcycle and carrying a rifle. The incident began Saturday morning when a citizen flagged down officers with the 77th Division to report a man riding a motorcycle with a rifle. Officers headed toward where the motorcycle was last seen and found a man matching the description at a nearby gas station. They pulled him over after he left the station. Police say the officers found a handgun in the suspect's waistband and a rifle in his side saddle. 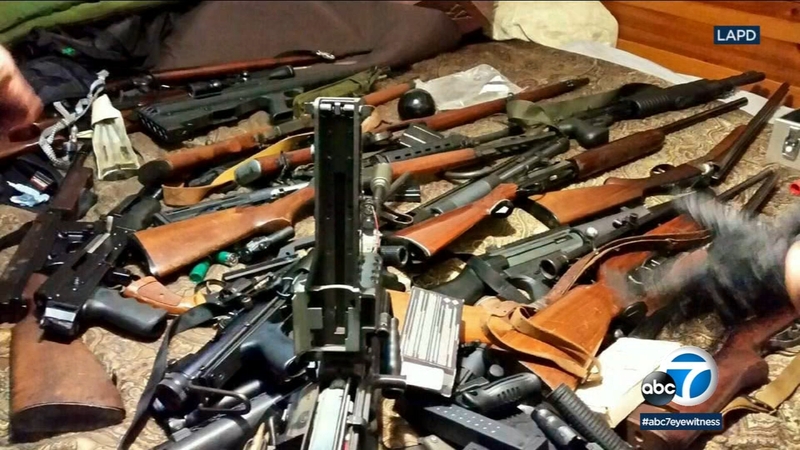 Police seized a cache of weapons from a South Los Angeles home. The man was arrested on felony weapons charges. Booking records identified the suspect as John Menzies, 50. He was being held on $500,000 bail. Officers later executed a search warrant at his home in South LA. There they say they found a cache of weapons that included: a rocket launcher, explosive materials TNT and PETN, 24 rifles, 12 handguns and silencers.